Optimum Security provides an array of security services to residents and business owners in the Cranbrook area. 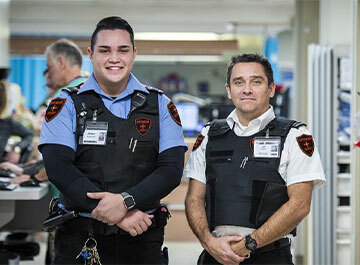 Our staff includes highly trained, uniformed security guards who work closely with law enforcement professionals in Cranbrook to ensure our clients’ safety. We also offer a selection of security systems and alarms for both homes and businesses. Learn more about the type of security services we offer. Hire a uniformed security guard to monitor and protect your home or business while you’re away. Our guards purposely maintain high levels of visibility to deter criminal activity on your property, and are trained to observe your property directly looking for signs of trouble. With the help of video cam footage and alarms, they monitor your property in real-time, resolving any problems quickly and efficiently. Additionally, our alarm systems come with a hands-free, two-way communication system that gives you direct access to our professional security monitoring team 24/7. At Optimum Security, our customers’ satisfaction is a top priority. It’s important to us that you feel safe in your home or business. Call us today to discuss how we can help you improve your property’s security features.